Home > The Bottom Line > Are Satellite Handhelds Still a Growth Market? Are Satellite Handhelds Still a Growth Market? Handheld telephones are a traditional, legacy of mobile satellite service, with these devices long used for remote satcom communications. However, in recent years, growth of handhelds has flatlined, driven by increased terrestrial connectivity, new alternatives and more versatile devices. With the market undergoing increasing change, the L-band land mobile market of the past isn’t the same as the one in the future. NSR identified how the land mobile business landscape is changing and how the future of this segment will develop. 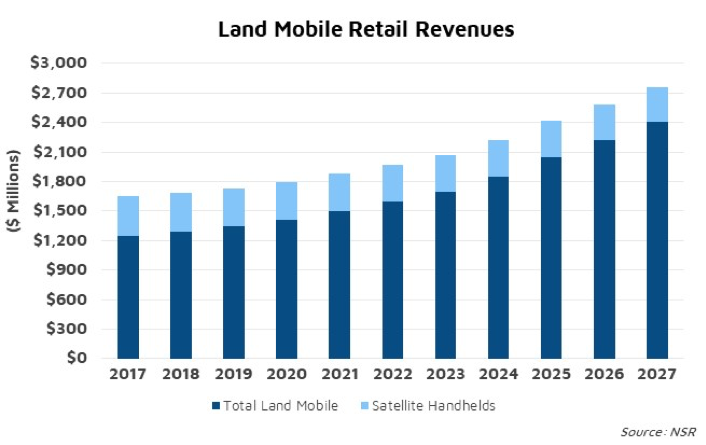 NSR’s recently released Land Mobile via Satellite, 6th Edition report found that total retail revenues for satellite handhelds (used commercially) will decline from $405 million today to $357 million in 2027. While the number of these traditional handhelds will increase from a large existing install base over the coming decade to more than 950,000 in 2027, per handset usage, and ARPUs, are declining. Handhelds have traditionally been used in the energy markets, newsgathering, maritime, aero, businesses in rural areas and a comparatively smaller number of consumers. In recent years, demand from these applications has seen a drop-off, and instead become increasingly event driven – seeing a sales bump when natural disasters occur, for instance in recent hurricanes in the Americas. However, sales increases during these periods are now significantly smaller, as agencies and organizations are now increasingly prepared for natural disasters, limiting further growth. More generally, a migration to more data-based usage and more versatile devices is restricting device growth. The increase in terrestrial networks has also contributed to declining usage of existing handheld devices and lower uptake of satellite handhelds. Because of this trend towards event driven usage, handhelds as a share of satellite land mobile will continue to decline long-term. Another Form to Factor In? Operators are thus now looking elsewhere for continued revenue streams, which resulted in a shift in research and development of new products towards hotspots, PTT and consumer handheld form factors that exhibit greater growth over the coming decade (from a smaller base). New types of devices are filling gaps in the market. For instance, the announcement of Thuraya’s new X5-Touch, an Android-based smartphone with a 5.2 inch screen, is an example of new products that have a more consumer focus, which is building upon other form factors. The Thuraya X5-Touch will build off the base of its handset business and drive new demand and ARPUs for greater bandwidth demand within Asia and MEA. While this phone could be used by consumers, the deployment of these products will mostly be deployed throughout organizations, and the familiar form factor and operating system will provide an existing pathway to upgrade to satellite- based units, rather than changing existing business workflows, simplifying connectivity between remote and central work groups. Other consumer-based form factors, such as the Garmin InReach, and the Globalstar SPOT are also exhibiting similar types of growth, and include additional features including messaging, GPS tracking and social media. This demand is moving from consumer eco-tourism use cases to more commercial and civil government, including forestry workers, and fleet tracking – more examples of consumer based products taking over more traditional form factors. With increased terrestrial and 5G networks around the corner, handheld unit sales have suffered, and so offering hybrid solutions and services will characterize ecosystems for land-mobile connectivity in the coming decade. While these networks have already significantly impacted both growth usage of handhelds, cellular compatibility can boost usage with other device types Developing dual mode solutions, such as Thuraya’s recently released, Thuraya WE Hotspot, the aforementioned X5-Touch are key to increasing product utilization across a larger number of users. Thuraya has led with dual mode product lineups. Iridium and Inmarsat will also need to introduce such similar products, either directly or through VARs and VAMs to keep their competitive edge. NSR previously noted the challenges that occur as capacity becomes commoditized, and handhelds are no exception. Lowering voice airtime pricing has also contributed to an overall decline in retail handheld revenues. Inmarsat’s lower price points are enabling more handsets connecting to the network; however, the result of this is that many of these are more ‘casual’ users compared to Iridium services. With airtime pricing declining, Thuraya, for instance, is now also selling top-ups for their satellite phones via their website to capture more of the revenue opportunity. Iridium and Inmarsat’s wholesale airtime model will also change moving forward and look increasingly outdated, as shifting to a managed services provider model will ensure growth as airtime becomes increasingly commoditized. This will be felt more in the M2M and IoT sector by integrating specific applications with satellite service, but should filter through to land mobile services longer term. This migration will begin with a greater retail presence for large customers to capture additional value, before shifting to smaller clients longer term. Diversification of operators’ product portfolios and moving to a more retail based model will be key to sustaining growth longer term as the share of traditional handheld revenues – once key to Land Mobile – continues to decline. While traditional handhelds will continue to remain in-service and grow, the revenue opportunity has peaked, and operators and service providers are moving onto greener pastures. This, combined with accepting terrestrial network integration and changing business models to a more retail play, will ensure land mobile via satellite continues to have a sustained future.